Crown of Thorns is a plant growing best in a sunny location Ideal temperatures are 62 to 65 degrees at night and 80 to 85 degrees during the day This is a very easy house plant to grow Proper name: Euphorbia splendens The plant you will receive is growing in a 4" pot. Besides the religious significance of the Crown of Thorns, the plant also has a famous meaning of good luck engrained deeply in many beliefs. Therefore, those who grow the plant should always be blessed with lots of good luck. 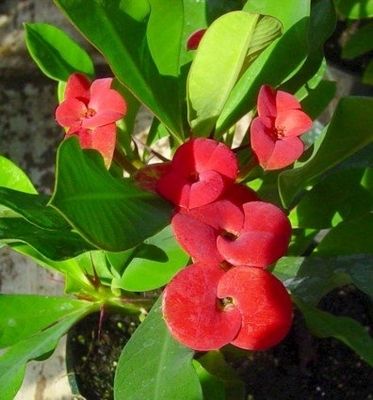 Crown of Thorns is a plant growing best in a sunny location. During periods of active growth, water when the soil surface becomes dry but when the plant is resting, keep it drier. Ideal temperatures are 62 to 65 degrees at night and 80 to 85 degrees during the day. The plant may be kept cooler during the winter. This is a very easy house plant to grow! Comments: Propagation is by cuttings. Allow the cuttings to dry before placement in the rooting medium. Proper name: Euphorbia splendens. The plant you will receive is growing in a 4" pot. It is in bud and bloom and about 6" tall. Well branched!